Eliminate Galling, Optimize Wear Resistance with CrN! CrN Coating for Optimal Wear Resistance! Having trouble forming parts? Try Chrome nitride (CrN) coating. CrN shines in heavy-duty forming applications, is hard, tough and has the best lubricity of the coatings we offer. If galling is a problem, CrN is the solution! We’ve had customers that were polishing their dies every 300 – 500 hits now getting 25,000, or more, hits without touching their dies. Some have even gone over 100,000 hits. CrN in forming applications, routinely provides 8x, or more, tool life, compared to uncoated tooling. 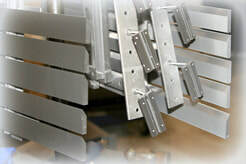 It also works better than thermal diffusion; eliminating the need for post-coat, heat treating. 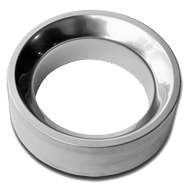 Besides forming dies, many different types of wear components (pump parts, shafts, etc.) and medical parts can be coated with CrN to improve lubricity and wear resistance, thereby increasing the life of the component 5 – 10 times. In a drawing application (stainless steel, more pressure), the Alpha™ coated tooling only produced 15 parts and the parts were too hot to touch. Uncoated, wood cutting blades last 3.5 to 4 hours between sharpenings. CrN coated, they last 8 to 10 hours. ​The CrN-coated shallow cutting blades(different design) last 8 to 10 times longer, compared to uncoated blades. 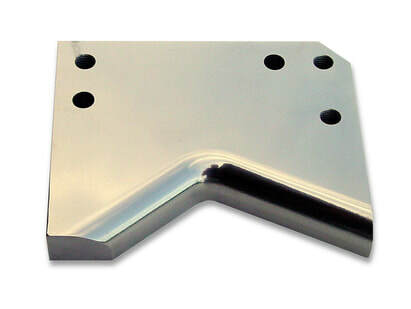 Less Die Polishing, Longer Tool Life with CrN Coating!